The 1841 whaleship Charles W. Morgan took an important step on her journey back to sea on Thursday, October 17, when shipwrights at Mystic Seaport in Mystic, CT, stepped the first of the ship’s three masts. 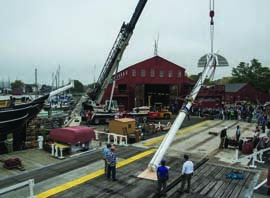 The Morgan was de-rigged and had her masts and spars removed at the outset of the ongoing five-year, multi-million dollar restoration at the Museum’s shipyard. Re-installing the masts, known as “stepping,” is an important occasion during a ship’s construction. “Stepping a mast is one of those milestones that marks both a new stage in the ship’s construction – or in this case, restoration – and the observance of a maritime tradition,” said Steve White, president of Mystic Seaport at a brief ceremony held alongside the ship. “It is tradition to place a coin under the base of a mast to provide good luck.” To mark significant events in the Morgan’s history, the Museum selected three coins for placement: a 1841 U.S. Silver Dollar representing the original launch of the Morgan; a 1941 U.S. Silver Half-Dollar signifying the ship’s arrival at Mystic Seaport; and a 2013 U.S. Silver Eagle symbolizing the current restoration. The most-forward mast, the foremast, was stepped on October 17. The other two masts, the main and mizzen, will be installed at a later date. The 1941 Half-Dollar was designated to be placed under the foremast. The 1841 Silver Dollar and the 2013 Silver Eagle will be placed under the mainmast and mizzenmast respectively. The 1941 coin was placed by nine-year-old Dylan Conforti of Charlestown, MA. Conforti, the grandson of former Mystic Seaport chairman Bill Cook, is a fourth grader at the Learning Project in Boston. For more information, visit mysticseaport.org. A new outright record for the Mount Gay Rum Around Jamestown Record was set on Wednesday, October 2. Anthony Kotoun of Newport, RI helmed Michael Dominguez’s Marstrom 32 catamaran Bronco around Conanicut Island with an elapsed time of 1 hour, 13 minutes and 17 seconds, besting the previous record by 34 minutes, 7 seconds. The Bronco crew made a last-minute decision to round the island to port, sailing north from the start off Fort Adams, on a southwesterly breeze ranging from 10 to 18 knots on an incoming tide. As this issue went to press, there was still time to attempt to break the new outright record and also secure one of the other divisional records: monohull and all sailing craft under 32 feet. If no other team had beaten Bronco’s time by October 31, the team will have secured the outright record for the Mount Gay Rum Around Jamestown Record. The Mount Gay Rum Around Jamestown Record is presented in association with Café Zelda and IYAC. The entry fee is $100 per attempt for any vessel over 20 feet and $50 for vessels 20 feet and under. A portion of each entry fee will support Sail Newport. The winning yacht will be awarded Mount Gay Rum equal to the skipper’s weight at the awards party at IYAC. Rob Goodwin, determined to find the best waves, racked up the two highest scoring rides, topping the Menehune Open Boys Final. Andrew Nota’s strategy was to take out his vintage 1963 single fin longboard and “get into the waves as early as possible,” to beat out the fast sectioning peaks. This strategy worked, especially evident when he picked off what was probably the best and biggest wave of the day, working it from the outside to win the Junior Men’s title. The biggest group of competitors, Wahine Girls, required several elimination heats to determine the winner. Kelly Giffault managed to slide across two nice right-handers, as she topped her sister Leigh in the final heat for the win. Charlotte Robbin not only took the most waves in the Wahine-Mini Girls Final, she also caught the best ones, edging out Georgia Parsons by ½ point to take the title. Nick Curci won the Kahuna-Boys division over Nico Foster. In one of the closest finals, Jim Robbin topped Rob Goodwin for the Ankle Biters crown by ½ point. This year’s competition was sponsored by New England Science & Sailing, the Connecticut Chapter of the Surfrider Foundation, the Eastern Surfing Association, Narragansett Surf and Skate, and the Town of Westerly. 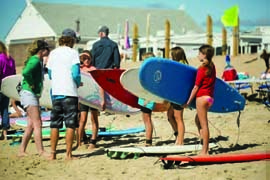 Peter Pan of the Peter Pan Surfing & SUP Academy in Narragansett, RI contributed to this report. 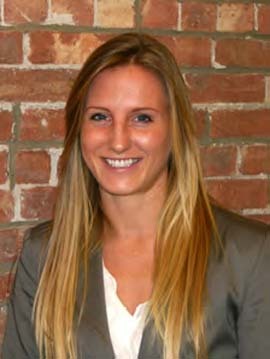 Mindy Cummings has joined Manuka Sports Event Management in Newport, RI as the Sponsorship and Marketing Manager. Cummings is a graduate of the University of Wisconsin, where she received a bachelors degree in Business with a focus on Consumer Affairs. Upon graduation, she headed to the University of Texas Austin where she completed her Masters in Sport Management. Cummings has worked with the Houston Astros in their customer relations department and also at Red Frog Events out of Chicago. She enjoys traveling and is a huge Packers, Badger and Longhorn fan, and is becoming a big fan of Newport as well. “We’re excited to have Mindy working with all of us here in Newport,” said Manuka Co-Founder/Managing Partner Julianna Barbieri. Manuka Sports Event Management owns, manages and represents a variety of sports events, teams and programs, and specializes in running environmentally sustainable events. Events created and run by Manuka include The Atlantic Cup presented by 11th Hour Racing, the Mount Gay Rum Around Jamestown Record, and the Pabst Blue Ribbon Striped Bass & Fluke Tournament. Visit manukasem.com for more information. The Newport Bermuda Race is introducing a new prize for the top boat sailing with just four crewmembers in the race’s Cruiser Division. 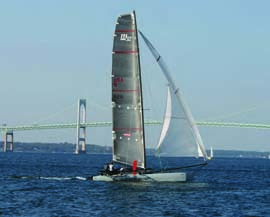 A Four-Handed Cruiser Prize will be awarded for the first time in the next Bermuda Race, which starts in Newport, RI on June 20, 2014. The Cruiser Division has had an average of 37 entries in the last three Newport Bermuda Races. Cruiser Division rules allow power-driven winches and sail furlers as well as mechanical and electro-mechanical steering devices. The rules restrict spinnakers and other light sails, limit the number of professional sailors, and prohibit professionals from steering. Registration is now open for the Cruising Club of America’s biennial US Sailing-sanctioned Safety at Sea Seminar, which will be held in Newport on March 15 & 16, 2014. For more information, visit bermudarace.com. “Melding my professional experience, significant involvement in issues related to environmental awareness and sustainability, and my academic background in marine biology and earth sciences education has me excited to work with the staff, board, partners and funders of Sailors for the Sea,” said Davis. “The organization has a solid base from which we can effectively implement a strategic growth plan, achieve higher impact with our programs, and appeal to a broad cross-section of donors.” For more information on Sailors for the Sea programs or to support the organization, visit sailorsforthesea.org. Hall Spars & Rigging in Bristol, RI has launched a new website. Created by Fleming + Company Inc. of Newport, the new website promotes Hall’s industry leading carbon fiber production technology in masts, booms and a wide variety of other marine products. The website has an e-commerce store containing over 4,000 products in total including ropes, fittings, boom vangs and a wide variety of rigging products. It also has a link to a Hall Composites website featuring the company’s work outside the marine industry, including the aerospace field. “We are very proud and excited about this new website,” said Ben Hall, Vice President of Hall Spars & Rigging. 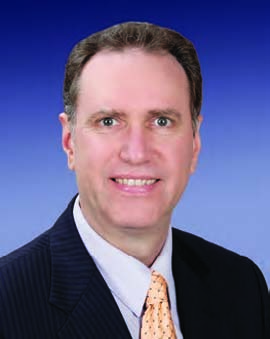 “It is both strategically and creatively a huge leap forward for us. The entire development process went very smoothly with our staff and the staff at Fleming + Company working together seamlessly toward one common goal; to create a user friendly web site that can move our business forward quickly while also allowing our staff to easily update the e-commerce store so it stays current.” Visit hallspars.com for more information. The WaterFront Center in Oyster Bay, NY and St. Dominic’s Schools have joined forces to offer the only STEM program on Long Island to combine the principles of Science, Technology, Engineering and Math with the sport of sailing. Seventy-three 7th and 8th grade students from St. Dominic Elementary School are taking part in two 15-day sessions in the fall and spring. Principal Cecilia St. John, was instrumental in this new undertaking and supporting her teachers. This opportunity is only available through The WaterFront Center. Visit thewaterfrontcenter.org for more information. “Our additional services include winter service and sail storage, sail assessment, alterations and recutting, sail and canvas washing, mildew and stain treatment, and sensible advice!” Wentz continued. “Stop in and say hello. 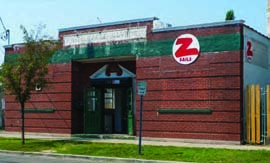 There are lots of cool things going on we can talk about.” For loft news and directions, visit zsails.com. Conanicut Marine Services, Inc. in Jamestown, RI unveiled its new solar photovoltaic system, the largest renewable-energy facility to be developed in the state’s marine trades to date, at a public ceremony on Monday, October 21. The 128-kilowatt solar array, built by E2SOL, a firm with U.S. offices in East Greenwich, RI that develops projects related to wind, solar and microhydro power, will provide 100% solar power to the 10-acre Taylor Point yard as well as to the National Grid under the Rhode Island Distributed Generation Program. On the same day, Conanicut Marine Services also received Clean Marina designation from the Rhode Island Coastal Resources Management Council. The statewide program rewards marinas that go beyond regulatory requirements by applying innovative pollution prevention practices to their day-to-day operations. For more information, visit conanicutmarina.com.